Welcome to Parkview Elementary School! Parkview Elementary School is located directly across from Hatten Park in the heart of New London. Parkview is the largest of our elementary schools and serves families with students in grades four-year-old kindergarten through fourth grade. Parkview has a rich history of strong family involvement and a culture that highlights the school district's mission, Success for All Students. Along with the core content areas of math, reading, writing, science, and social studies, students at Parkview are exposed to art, music, physical education, guidance, and computers. We strive to find success for all our students as we help prepare for their future as they become contributing members to our community. 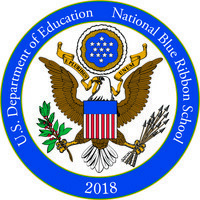 Parkview Elementary is a 2018 National Blue Ribbon School. I am excited and honored to welcome each and every one of you to Parkview Elementary. Our school mission and vision is “Success for All Students.” We create success for all students through differentiated instruction to reach students at their level. As you walk through our school you will see energized, dynamic teachers and students who are engaged in their learning. We all strive to build positive relationships with our students and community. I feel very fortunate to be the principal at Parkview Elementary and look forward to serving the students, parents, teachers and Parkview Community. Please feel free to email, call, or stop by the school and visit. I would be happy to discuss the many great aspects happening at Parkview Elementary.